Since 2014, the Self-Help International (SHI) micro-credit program has been focusing developing the professional skills of women and youth beneficiaries. These skills will provide meaningful incomes while enabling them to remain in their communities and homes to take care of their families. With new job skills in practice, beneficiaries will benefit with new job opportunities, better nutrition and learning how to save money. Self-Help also provided courses in piñata design and funeral wreaths for All Souls’ Day so beneficiaries can increase the variety of their services and grow their businesses and income. In addition, SHI offered training courses for personal development including classes in self-esteem, gender, reproductive health, health and nutrition. 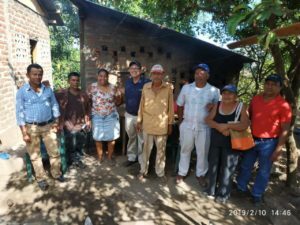 Self-Help’s newest micro-credit group (see photo above) is made up of nine women from the community of Empalme de Cruz Verde. Together, the women went through all the required training offered by Self-Help International before they could get their loans. Over a three-month period, the women took courses in self-esteem, business management, business planning, pickling vegetables, hot pepper sauces, jelly and marmalades. After training each woman got her first loan of $50. The women will use the funds to grow their small business some of which include making and selling tortillas, cosmetology, buying and selling grains, buying and selling products, growing vegetables and much more. SHI is working in six different communities with 84 women beneficiaries. The beneficiaries are sharing their positive experiences with other women from their communities. News of Self-Help’s programs is traveling from community to community and more women are interested in SHI’s training and personal development skills. Adelina is from Las Azucenas and is a tailor. She keeps herself busy with sewing projects for her community including school and cheerleading uniforms, skirts, dresses, table cloth, bags, among other products. 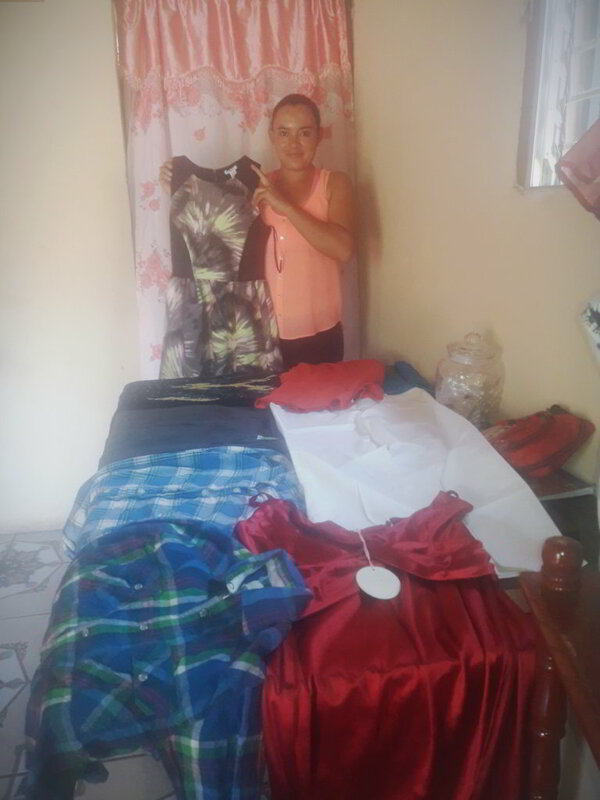 In the photo below, Adelina is displaying aprons she made for Self-Help International to be used by micro-credit beneficiaries that are baking, selling products in the street or in the local market. And while preparing food. 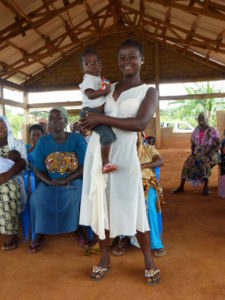 Adelina said she thankful for the support and training the micro-credit program has provided to her.